The first EV I got to drive back in 2012 was the Nissan Leaf. The range on the Mk1 Leaf was about 100 miles, although in the real world this was more likely to be around 65-70 miles & you really needed to drive conservatively, especially on the motorway to achieve this. The Mk2 Leaf improved this, with a range of 125 miles, with about 100 miles being achievable, the same as in sister car the Renault Zoe. Then along came Tesla. In the UK anyway, the cheapest model in the Tesla range is the Model S 75d, which costs £73,500. Although it looks good, offers amazing performance & comes the largest touchscreen & best tech out there, 75k is an awful lot to pay for a family car, even if it will do 200 miles on a single charge. What customers really want, is an affordable family car, preferably one that looks like an SUV, with a decent EV range of between 200 & 300 miles. Step forward then, the humble Hyundai Kona EV, launched in late 2018, which is the first fully-electric subcompact SUV in Europe. With a more realistic price point for the entry level SE with a 39kW battery, of £27,250, after the government grant of £3,500. Could the Kona EV really be the first affordable electric car that offers a 200 mile range ? 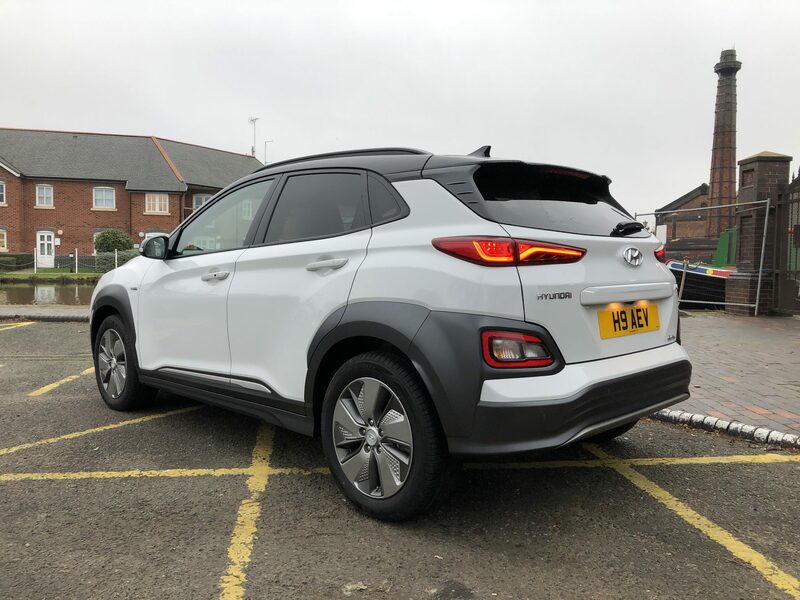 As fleet customers are more likely to want a greater range than 200 miles, Hyundai loaned us the range topping Premium model, fitted with the larger capacity 64kW battery, which offers a claimed range of nearly 250+ miles & retails at £32,845, after the government grant of £3,500. At first glance, the Kona EV looks just as attractive from the outside as the petrol Kona. 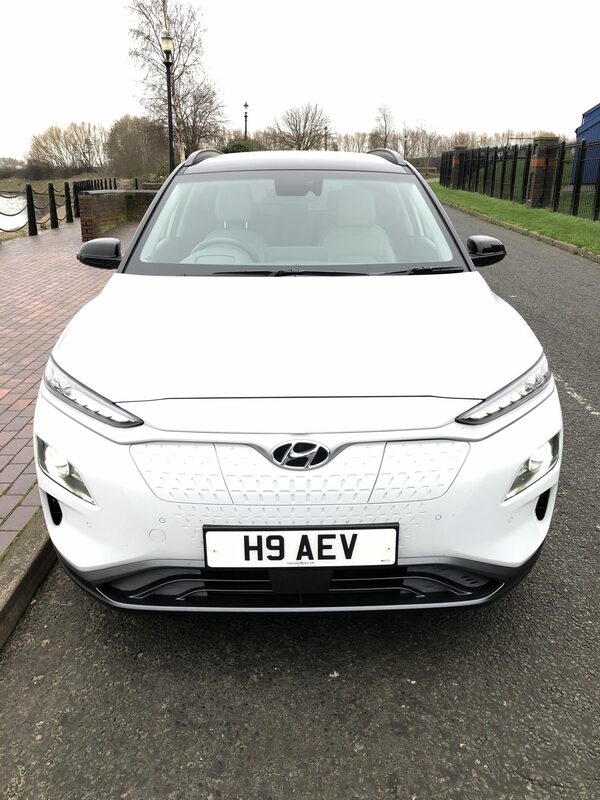 The EV shares the same overall design with the Kona petrol models, apart from the lack of a front grille on the electric version, where the charging plug is located. Inside too, the EV mirrors the petrol Kona with a functional, well laid out dashboard & on-trend connectivity & tech. There’s a reach & rake steering wheel & the electrically adjustable seats mean that there’s no reason you can’t get comfortable in this car. The dashboard fixtures & fittings are pleasantly finished, in a mix of hard & soft touch plastics, in a colour combination of silver & grey. 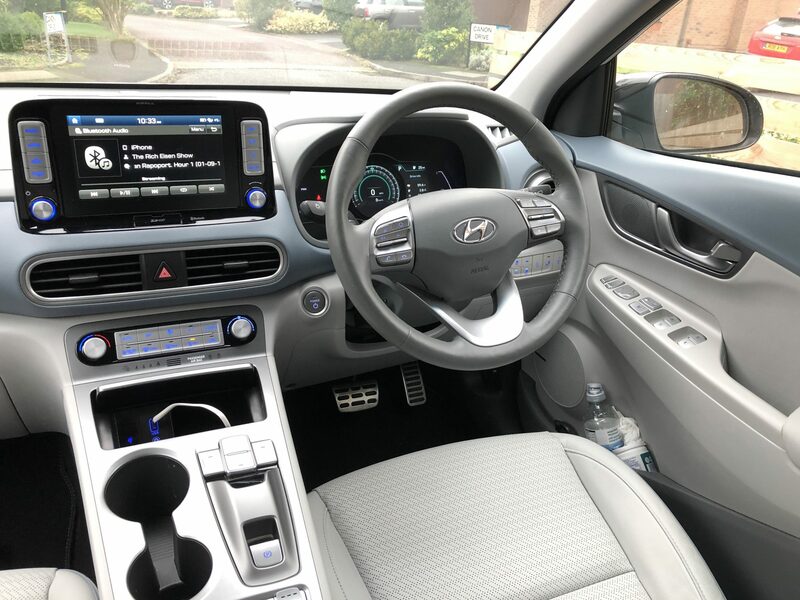 The seats & steering wheel, are finished in light grey leather.The quality is good, as you’d expect from a Korean car, with the infotainment screen, steering wheel controls & general layout familiar to anyone who’s driven other Hyundai or KIA models before. There are some notable differences in the cabin, between the EV & petrol models. 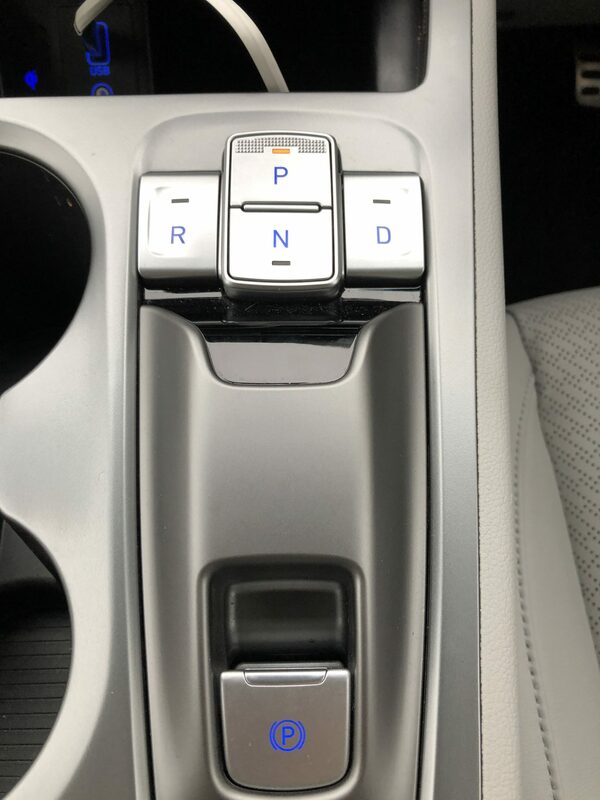 There’s no traditional gear selector, just four buttons located between the front seats, offering a choice of Drive, Reverse, Park or Neutral. There’s also three drive modes: Eco, Comfort & Sport, which can be selected using a switch just behind the electric parking brake. The Kona EV also comes with clever steering-wheel mounted paddles to increase or decrease the braking regeneration. This gives you a choice of four regenerative levels; 0, 1, 2 or 3. As we discovered, very much as with the Nissan Leaf, the lower settings work best on the motorway or open roads, the higher ones best in urban areas, or slow moving traffic. As far as practicality in the cabin goes, the Kona EV offers a decent sized glove box, an armrest box in the centre binnacle, a small push-shut cubby in front of the gear buttons, which hides the aux-in, USB & phone charger, as well as two smallish door pockets, big enough for one bottle of water each. In the rear the door pockets are slim, as are the storage nets on the rear of the front seats, so not a lot of useful storage is actually offered in the back. The Premium model comes very well kitted out with a long list of goodies, including the battery-reducing heated front seats & a heated steering wheel. There’s also an Auto Hold function for the automatic hand brake. The heating controls can be adjusted to just warm or cool the drivers side of the car which is energy saving & a nice touch. In common with all EV cars, when it’s cold outside, your EV warms up a lot faster than a petrol or diesel car. The inside of the drivers door features buttons that control the electrically folding wing mirrors, four electric windows, window lock & the car lock/unlock button. On the right of the dashboard, are a row of switches that include Lane Departure Warning, which we always turn off & something called VESS, which I discovered stands for Virtual Engine Sound System, which can be activated to allow your EV to emit a noise to make pedestrians aware that your car is near them. There’s a 332-litre boot on offer which is split 3 ways. 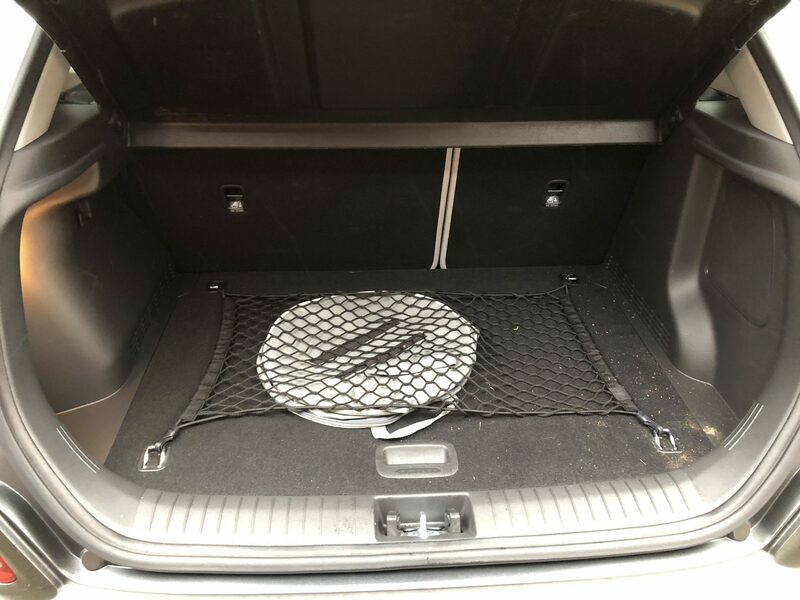 The larger load space, which sits close to the boot lip, hides a lift up floor, underneath which you’ll find a tray to store valuables. This too lifts up & underneath this you’ll discover the domestic 3 Pin charging cable & car tools. Out & about, the Kona EV is naturally quiet & there’s instant torque available from the get go. It feels rapid, the 0-62mph time is actually 7.6 seconds & on exiting a junction, that torque can lead to a bit of wheel spin on wet tarmac. At faster speeds, the outside road noise from the low-rolling-resistance tyres on 17″ alloys, does enter the cabin, but it’s never overwhelming. In town, the Kona EV is pleasure to drive. Quiet, nippy & small enough to park up on the side of the road. I really liked the simple button gear change selecter. To conserve energy, we selected the Eco Drive mode for our week in the Kona. Despite it’s weight of 1685kg, after all the EV version is fitted with a 204ps (150kW) electric motor & a 64kWh lithium-ion battery, the Kona EV is comfortable to be in & offers okay driving dynamics. Certainly it’s no worse than many other cars out there. There is thanks to the battery, reasonable body roll & you’ll also notice that the energy recuperation when braking, makes smooth stops tricky. Motorway cruising is best done at no more than 70 mph to retain battery range, but if required the Kona EV will happily push on from this. I stopped off at Chester Services to check out the EV charging option’s there. The Kona EV has a CCS Combo port for 50kW public rapid charging, allowing it to charge up to 80% in 75 minutes. Chester I’m pleased to say, does offer rapid charging. Charging at home on my Rolec 7kw home charger with the 7 pin Type 2 connector, from a range of 21 miles to a full range of 251 took 6.5 hours. If you don’t have a home EV charger, things are not so rosy. Using the supplied cable with a 3 Pin plug with a standard domestic electricity supply, it would take around 30 hours to charge to 95%. Real world cost & range are probably the two things, most potential EV customers want to know & of course, to confuse matters, it’s not an exact science. Looking at our week in the Kona EV, we drove 246 miles. With the average kW costing 12.5p from UK electricity suppliers, if you multiply the size of our Kona’s battery which was 64kW, by 12.5p. This gives you a figure of 800 which equates to 800p or £8. So the cost to charge the Kona EV fitted with a 64kW battery from zero to full, on a 7kW home charger, where electricity costs tend to be cheaper than at service stations, is about £8 which I think is excellent. Using a public charger, such as the one’s on offer at Chester Services, will surprise, surprise, cost you more than 12.5p kW. 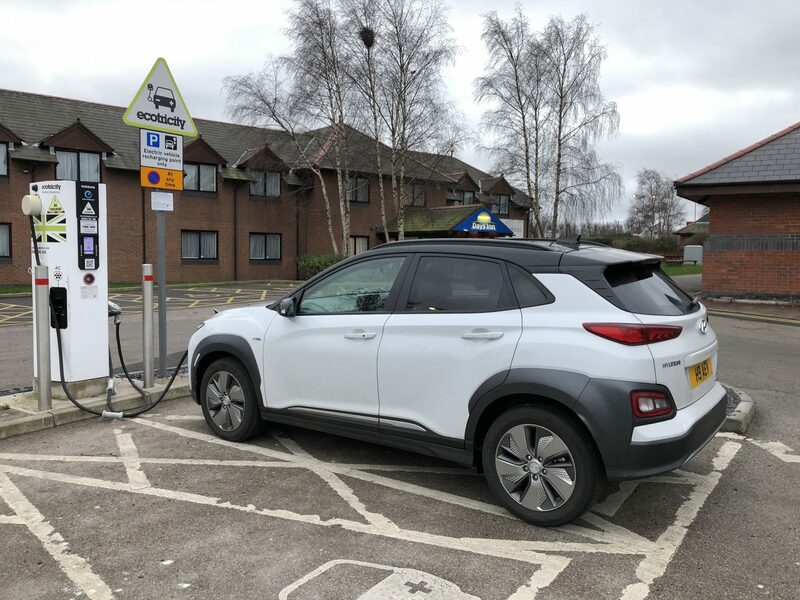 EV users though, can sign up to discount schemes which allow the use of public EV chargers at a reduced cost, so this is well worth considering if you buy or lease an EV. A cost of £8 to get a range of 246 miles in the Kona EV & actually getting 202 miles on the single charge, still compares favourably with what it would cost to go the same distance in the 1.0 petrol Kona we tested last year, in which which averaged 42mpg. At current petrol prices of £1.31 per litre, the cost of going 202 miles in the petrol Kona would be close to £28, which is £20 more. If you’re more careful than I was & drive on the motorway at a constant 70 mph & utilise the regeneration on offer, I do believe that 246 miles on a full charge would be possible. Indeed, other motoring writers have got the range in the Kona EV close to 300 miles which when you look at the cost of one, is frankly brilliant ! All sounds reasonable enough, doesn’t it? But here’s the Kona Electric’s trump card: pricing. Factor in the UK grant for plug-in vehicles and the 39kW model in Premium trim will cost you £28,720. Compare this to the similarly priced Nissan Leaf & VW E-Golf , both with almost half of the Kona’s 200 mile range & it should be clear just how good the Kona Electric is. 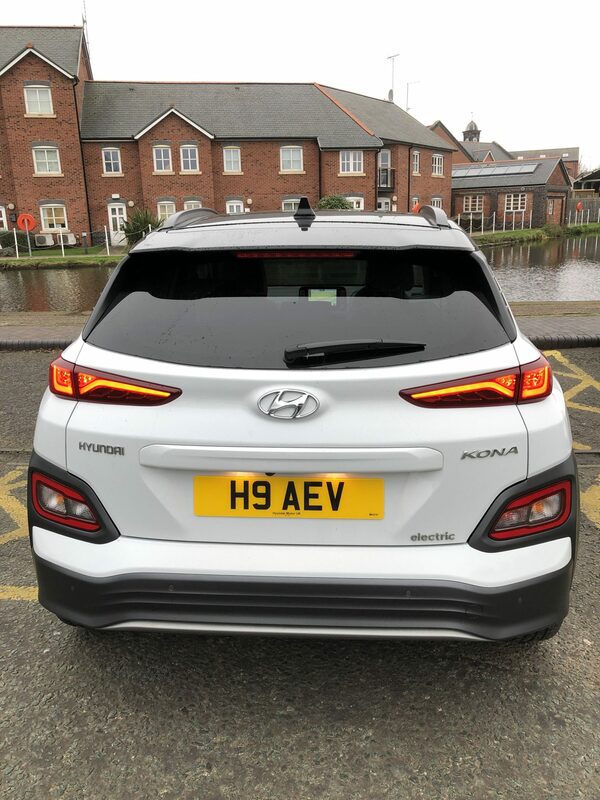 If you’ve read my review all the way through, hopefully, as an SME fleet manager or end user, you’ll feel more confident in considering an EV a your next company car. In early 2019, the Kona EV is ahead of the pack. It’s well priced, very cheap to run & offers a battery range of 200 miles, on even the 39kW version. You really need a home EV socket – Rolec offer theirs for around £250 including the government grant – & if there’s a charger at work too, that’s a bonus. 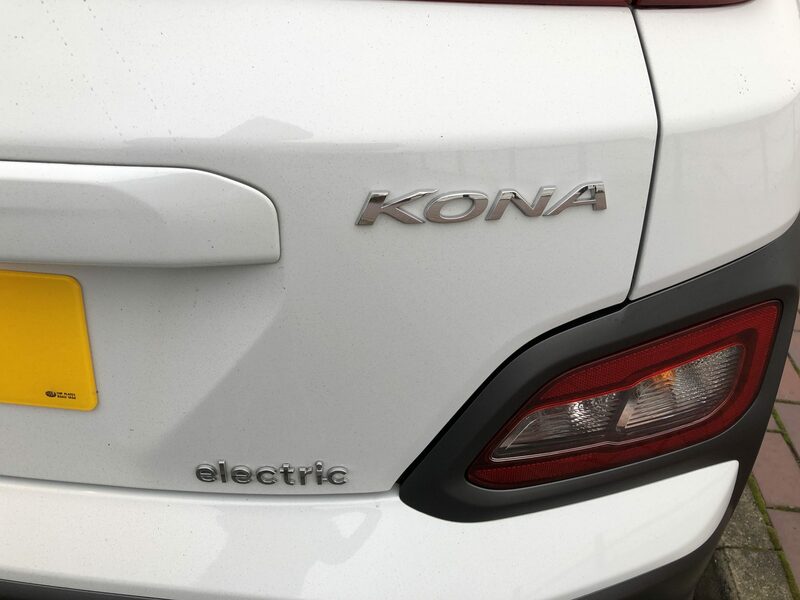 What the Kona Electic has done, is make the ownership of an electric car, far more attractive than ever before. Hat’s of the Hyundai who I’m sure, with sister brands KIA Niro EV arriving shortly, won’t be resting on their laurels. A thoroughly well deserved 4.5/5.